This frozen treat makes a simple and refreshing dessert similar to ice cream. We’ve topped our recipe with frozen blueberries, but any fresh or frozen fruit would make a great topping. A sprinkling of your favorite nuts or seeds would also be a great addition. Put peeled and quartered bananas in a freezer bag and keep them on hand in your freezer so that they are at the ready to make this delicious dessert when you want it. This is a great way to extend the life of bananas that are reaching their prime and satisfy your sweet tooth all at the same time. Remove bananas from freezer and defrost at room temperature for 2 to 5 minutes. Put bananas and honey in a food processor or blender. Process or blend until smooth. 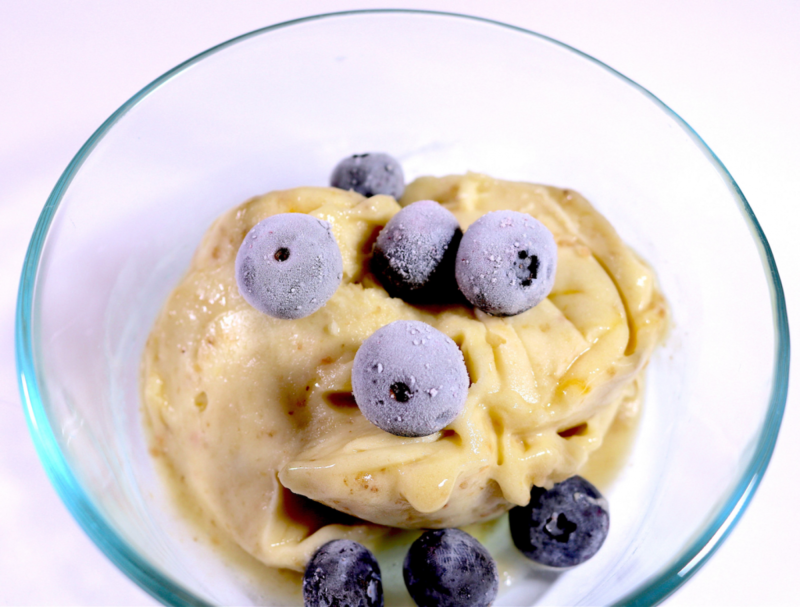 Divide frozen banana blend evenly into 4 bowls and top with frozen blueberries.